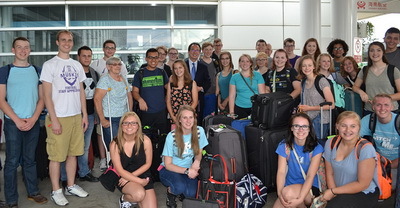 On July 23, Consul General Hong Lei went to Chicago O’HARE International Airport to greet Muscatine High School Choir. The Choir, consisting of 28 students and 4 chaperones, was departing for Beijing to participate in 13th China International Musical Festival and Concert for Love & Charity and 35th Anniversary of China Children and Teenagers Foundation. After the performance, they will visit the sister city Zhengding, Heibei province and have friendly exchange with local people. Consul General Hong Lei told the Choir that he is pleased to have opportunity to see off young friends from Muscatine right after his arrival in Chicago yesterday. The 13th China International Musical Festival is the largest and highest level chorus festival in China. He has no doubt that Choir’s musical talent will be fully demonstrated and the splendid sound of Musctine will be taken to the Chinese people. At the same time, the Choir’s visit will not only further deepen friendly ties between people of Muscatine and Zhengding, but also leave a very important imprint in the history of cities’ friendly exchanges. Along the visit, you will experience the Chinese ancient history, splendid culture, present China and Chinese people’s hospitality, all of which would make your visit worthwhile. Handing out the Chinese lucky knots and books on China, Consul General Hong wished every member of the group pleasant trip and successful performance. The students were excited by the upcoming visit which they are very much looking forward to in their hearts. They wished that the visit will help them understand more about China and make more Chinese friends. They also expressed that they will share their China stories with families and friends in Muscatine after they come back.